This question arose from a conversation over the weekend and we tied ourselves in knots trying to get to the bottom of it. I didn’t have time to put a simple circuit together so it would be great to get some expert thoughts on this. (1) With SW1 open, assuming the buck convertor is 80% efficient, what is the expected value of A2? (2) With SW1 closed, same question/assumptions. (4) What is the correct way to talk about the difference between measurements at A1 and A2. Is it correct to say that the excess current (46mA) flows into the negative terminals of the buck converter? The module shorts the In- and Out- terminals internally (making SW1 irrelevant as folks have pointed out). This module forced me to place the ammeter on the return side of the circuit since it effectively shorts the -ve power and test terminals. Forget about the SW1 switch open or closed it doesn't matters. 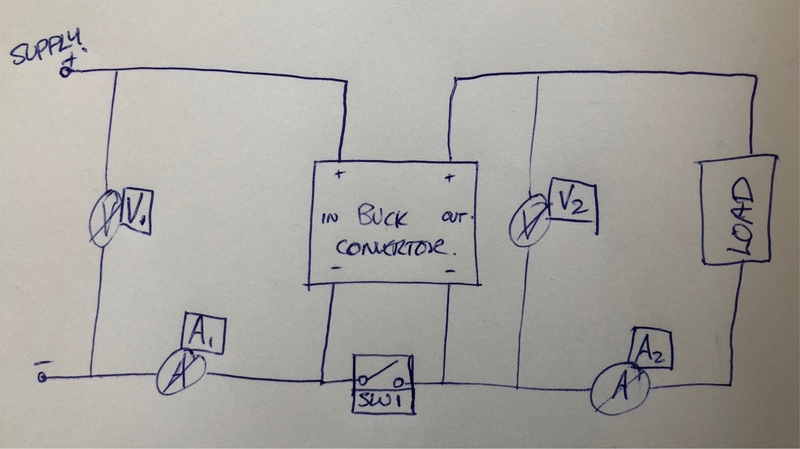 Because the input and output are not completely isolated(means -ve will be common for input and output).They are already interconnected inside the buck converter itself. The answer to your first question is that in theory ,you can take 96mA output from A2 but it still purely depends on the load. Buck converter efficiency will vary depending on the load. If you have lighter load on the output side,the efficiency will be much good. If you have more heavy load,then it's efficiency will start to degrade.The degraded performance is due to dissipation of heat due to heavy loads. So practically it not the case that you'll always have constant efficiency irrespective of the load at the output of the buck converter. Here the buck converter is a "positive" regulator meaning that in- and out- are shorted in the converter as well. 80% * 0.6 W = 0.48 W at the output. 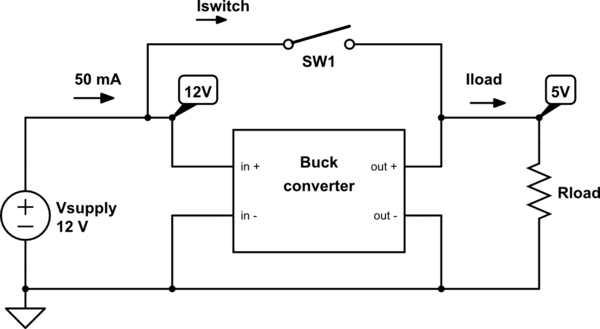 (2,3) When SW1 is closed a typical Buck converter will switch off. That is because when SW1 closes 12 V is connected directly to the output making the output voltage larger than 5 V. A buck converter designed for a 5 V output voltage will then decide that it does not need to do anything (the output voltage is high enough) so it will switch off (or at least, not provide more power to its output). Assuming the Rload is still 52.1 ohm and that this buck converter also switches off and consumes no current: Iswitch = Iload = 12 V / 52.1 ohm = 0.23 A. Do note that the load now gets 12 V, not 5V. Not the answer you're looking for? Browse other questions tagged power current buck step-down or ask your own question. How do I Power a LED sign?